This entry was posted in Computer, Murmuring, Network, Service and tagged cpu, digitalocean, hosting, latency, linode, md5, network, openssl, performance, smokeping, speed, vps, vultr on June 12, 2018 by Gea-Suan Lin. 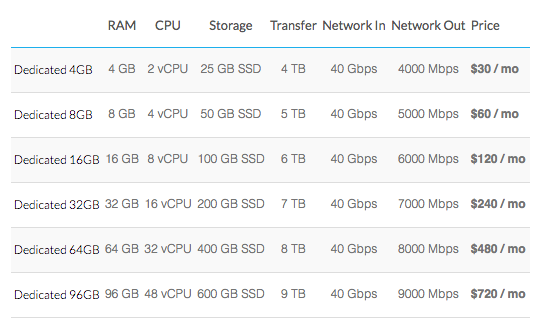 And finally, the existing Linode 2GB ($10/mo) plan is receiving a free storage upgrade from 24GiB to 30GiB. And finally finally, we’ve also increased the outbound network speed limit on all plans to be at minimum 1000 Mbits. Existing Linodes will need to reboot to pick up the new value, that’s it! This entry was posted in Computer, Murmuring, Network and tagged balancer, bandwidth, digitalocean, instance, linode, load, memory, vps on February 15, 2017 by Gea-Suan Lin. Tokyo 1 is at capacity and we have no plans to add any additional. You will need to move out of Tokyo 1 for plan upgrades, KVM, newest hardware, and so on. This entry was posted in Computer, Murmuring, Network and tagged hosting, japan, linode, tokyo, vps on November 22, 2016 by Gea-Suan Lin. We’re opening a brand new Tokyo facility next month. This will enable customers in the region to take advantage of several recent Linode announcements: KVM hypervisor, our latest plan specs including double the RAM and SSD servers, and mass availability. Stay tuned for the announcement within the next few weeks. This entry was posted in Computer, Hardware, Murmuring, Network and tagged center, data, japan, linode, network, tokyo, vps on November 13, 2016 by Gea-Suan Lin. Linode will be opening a new datacenter in Shibagawa ward, Tokyo, Japan, this fall and I was able to interview Linode’s datacenter operations manager, Brett Kaplan, who answered questions I asked regarding the upcoming Tokyo datacenter launch. Soh: Can you say when this new datacenter is expected to come online? Brett: We are hoping to launch later in Q4 this year. Soh: So, where did you decide to establish the second Tokyo location? Brett: We are utilizing an Equinix datacenter in Shinagawa ward Tokyo, Japan. This entry was posted in Cloud, Computer, Hardware, Murmuring, Network and tagged center, data, equinix, japan, linode, shinagawa, tokyo, vps on September 27, 2016 by Gea-Suan Lin. This entry was posted in Cloud, Computer, Hardware, Murmuring, Network and tagged linode, tokyo, vps on September 22, 2016 by Gea-Suan Lin.